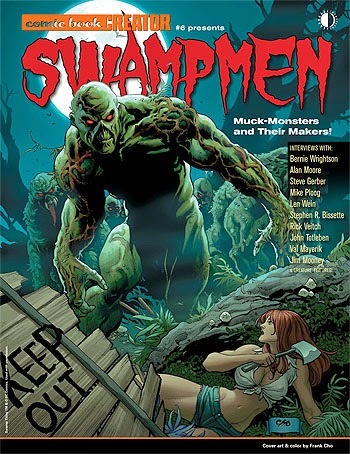 Originally planned for release in 2005, Swampmen: Muck-Monsters And Their Makers succumbed to a myriad of logistical problems that caused the book to languish in the mire of never-documented comic book history—until now! After a decade of regular requests from fans, the book has finally risen from the muck, and is now shipping to stores worldwide. Swampmen: Muck-Monsters And Their Makers examines all the creepy man-critters that crawled out of the bayou back in the 1970s, through the memories of the artists and writers who created such characters as Swamp Thing, Man-Thing, The Heap, Lurker of the Swamp, It, Bog Beast, and even Marvin the Dead Thing. It features a stunning line-up of interviews, includingBERNIE WRIGHTSON, ALAN MOORE, MIKE PLOOG, LEN WEIN, FRANK BRUNNER, STEVE GERBER, STEPHEN R. BISSETTE, RICK VEITCH, GERRY CONWAY, VAL MAYERIK, JOE ORLANDO, MARTY PASKO, JIM MOONEY, JOHN TOTLEBEN, TOM YEATES, KAREN BERGER, JESSE SANTOS, MICHAEL USLAN, MICHAEL W. KALUTA, LOUISE SIMONSON, ROY THOMAS, and the remembrances of many others. Behind its chilling FRANK CHO cover, there's also these astounding stories: "It Started with 'It': The THEODORE STURGEON Connection"; "The Romance of 'Swamp Thing': Heartbreak Inside the House of Secrets"; "With the Helping of the Heap: Alan Moore's Anatomy Lesson"; "Jesus is Not Alright with DC: Rick Veitch and Cancelled Comics of Calvary"; and "The Lost Bernie Wrightson Swamp Thing Graphic Novel." Over ten years in the making, this is the definitive look at that ground-breaking horror comics sub-genre, and is edited by JON B. COOKE (editor of Comic Book Creator magazine).